Super easy to use and set up. Reasonable, although not the cheapest. Summary: If you want a portable and beautifully-designed art projector, we think the Impression1400 would be a worthwhile investment. It’s high-quality, it comes with a lot of benefits and features, it looks great and it’s easy to use. While Artograph offers a wide range of quality fine art projectors for artists on every budget, if you are like us, it is likely that you will be most interested in Artograph’s Impression1400 digital art projector, which combines high-quality features with an attractive price point to offer every artist a great value. Before jumping into a more in-depth review of this particular fine art projector, let’s take a moment to explain just how a fine art projector compares to your traditional overhead projector. Your traditional projector, which is large and bulky, is traditionally designed and sold with boring powerpoint presentations (or, if you are lucky, movie viewing) in mind. On the other hand, fine art projectors are custom built to effectively cater to the needs of the modern artist. Instead of being designed with grainy powerpoints or movies in mind, art projectors are engineered to emit the highest quality rendition of whichever digital document you choose. This works just as I had hoped. It took me a bit to figure it out, but when I finally did (with the help of customer service..which is great).... it is perfect for what i am doing. We have not tried it yet for movies, but we will. Would recommend. Better yet, many art projectors, such as those offered by Artograph, are able to rear-project images will little to no additional setup required, allowing you to project your chosen images directly onto your canvas right after unpacking your new projector. If you have found yourself interested in recreating famous artworks or placing your own artistic twist on well-known images, you are sure to love the Impression1400 art projector. On the other hand, if originality is your cup of tea, this projector will allow you to work towards creating the next world-renowned masterpiece in a manner that is equal parts intuitive and effortless. In a sense, digital art projectors such as the Impression1400 give modern artists like yourself access to a limitless number of potential sources of inspiration. This fact is especially true for those that may find themselves in a physical location that lacks beautiful natural landscapes or agreeable weather for painting outdoors, meaning that a small investment in a digital art projector can completely alter how you go about planning and executing your creative sessions. Such opportunities represent a noticeable paradigm shift in the level of access to artistic resources, which very well could mean that as innovative technology and traditional artistic approaches continue to converge we may see a new, modern Renaissance in the worlds of painting, digital design, and other notable creative endeavours. For as long as modern art has been pursued by creatives throughout the world, natural landscapes have been of great interest to painters and photographers alike. On the surface, this common interest makes sense, as when natural beauty and artistic expression are effectively combined it can lead to breathtaking artworks capable of producing a moving and emotional experience. Clearly, there is a clear level of overlap between the artistic interests and pursuits of both painters and photographers. And yet, travel to far away and exotic lands to create artistic works on-site can oftentimes be cost prohibitive for those hoping to paint such landscapes in person. At the same time, highly skilled photographers are oftentimes able to make a living off of their work, which in turn allows them to travel around the world without the fear of funding in the back of their mind. To sum it up it has excellent resolution, plug and play ready, easy to set up and operate. You won't be disappointed. These issues for painters are exacerbated by the fact that even if you are able to secure funding for your artistic travels, poor weather could easily ruin your chances of creating your own masterpiece, leading to a frustrating and confusing process for those creatives who decide to attempt it. So, what if there was an affordable solution that would allow you to paint any landscape or location in the world, regardless of your lack of funding for travel? Enter the Artograph line of high quality, professional grade fine art projectors, which allow artists just like you to gain inspiration for their next great work from the comfort of their own home or studio. Just Who are Digital Art Projectors for? In short, digital art projectors can and should be considered by anyone interested in combining tried and true artistic methods with cutting edge technologies. With this being said, for those looking to take advantage of innovative technologies throughout their creative process, the Impression1400 might not be right for everyone. In an effort to help you decide whether or not an art projector represents a wise resource for you, let’s quickly cover the best and worst fits for an artistically-minded technology such as this. For those of you that are dedicated, yet developing artists that would like some subtle assistance while working on your painting skills, the Impression1400 art projector may very well represent one of the best training tools available on the market at such an attractive price point. Short of investing in expensive painting classes led by expert instructors (which very well may not be possible for all of you out there), this projector represents one of the best investments you can make to further your artistic pursuits as either a fulfilling hobby or a successful side-business (or, if you are brave enough, career). The Impression1400 is a serious artist tool for serious artists. Professional artists will find its grids and perspective arrays to be extremely useful and will generally love this projector. I find it an outstanding device in the studio and even outdoors at night where electricity is available (obviously, only in fine weather). Similarly, if you are a creative individual interested in combining the mediums of photography and painting in one smooth stroke, this projector may just be the perfect tool for you. With its ability to vividly project almost any file format, you are guaranteed to be able to develop paintings inspired by photographs that you may have been able to capture while out and about throughout your day. Furthermore, this particular art projectors would be a great option for those of you who are interested in introducing themselves to the field of landscape painting without having to deal with the hassle and financial burden that can oftentimes come along with the hobby. On the other hand, there is a likely chance that the Impression1400 might not be right for all of our readers. For example, if you find yourself to be an individual who feels strongly about the use of artistic aids, this product may not be for you. This would be especially true if you find yourself feeling that utilizing a fine art projector to be a form of copying or “artistic cheating”. While it is often said that great artists steal, this viewpoint is completely understandable, as you may have a different set of artistic ethics than your friends or colleagues. Regardless, it is important that you choose whether or not this fine art projector is right for you on your own accord, as only you are capable of deciding the tools needed to fully capture your artistic potential. Similarly, you may have strong feelings against the utilization of a fine art projector such as Artograph’s Impression1400 if you are someone who doesn’t want to be disturbed by the sights and sounds of technology during your creative endeavours. Once again, this position is more than understanding, as nothing is more capable of derailing a person’s creative process than the need to deal with technical difficulties while in the middle of creating a work of art. With this being said, please know that these viewpoints are not intent on swaying you in one direction or another when it comes to the topic of fine art projectors. In fact, we have spent the time to carefully craft this review of the Impression1400 Art Projector in an effort to allow our readers to make the most informed purchasing decisions possible. To help further this informative experience, let’s take some time to look at some of the features that this particular fine art projector offers and help you figure out whether or not it is the right fit for your personal tastes. What are Some of the Impression1400's Best Features? Whenever reviewing a projector (or any product for that matter) it can be extremely helpful to learn more about some of the most and least impressive features offered by the unit. Through such analysis, readers are empowered to make the best buying decisions possible. In short, taking the time to walk through the features of a product like a fine art projector can help to ensure that you make an informed decision while shopping for your art supplies. With this in mind, here are some of our favorite (and least favorite) features included with the Artograph Impression1400 Art Projector. For those of us that know a lot about projectors, it is well known that most traditional projectors are bulky and unwieldy. In other words, projectors are oftentimes large and difficult to use. 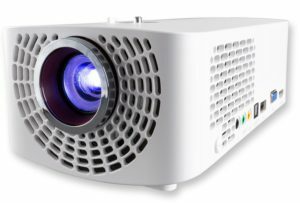 The Impression1400 breaks this mold, offering a sleek and portable projector at an always affordable price. With a footprint of 8.7 x 5.2 inches and a height of only 3.3 inches, this projector is a true pleasure to carry, and may even fit within your existing travel bags (if, for example, you typically utilize a large tote when traveling to your creative space). This sleek design is complemented by a weight of only 3.3 pounds, meaning that this fine art projector weighs about as much as your average sized laptop these days. These features combine to make the Impression1400 art projector a true joy to use, regardless of how far you may have to travel. Whether you find yourself traveling across your home/apartment or across the entire city itself, this modern and user-friendly fine art projector will not present you with any issues where portability is concerned. Better yet, this unit’s portability is complemented with a built-in tripod mount, ensuring that regardless of where you go, your fine art projector will be ready to take on whatever artistic challenges you may present to it. For a fine art projector as reasonably priced as the Impression1400, it would be understandable for you to expect that this particular unit would likely have a poor image quality. Yet, these low expectations seem to be easily surpassed thanks to this fine art projector’s high image quality. When the unit is turned on, you are greeted with a full high definition projection of 1920 x 1080 pixels, complemented with a projection range of 3 to 10 feet. Paired with a bright bulb of 1400 lumens, which is more than enough for a projector of this type. Furthermore, the lamp bulb utilized by this fine art projector is rated for 30,000 maintenance free hours of use, ensuring that even the most active artists will be able to use this projector for a long while without experiencing any issues. Overall, if you value a strong image quality over anything else, you are almost guaranteed to fall in love with this fine art projector, especially at a price as attractive as this. Strong support for different types of input ports can be a frustrating issue for even some of the best projectors out there. Thankfully, this projector will not present you with any of these frustrating issues. This particular fine art projector supports a varied collection of ports that manages to encompass all of the popular connection types of the day. From HDMI to USB and RGB to Component, the Artograph Impression1400 is able to ensure that your image will be projected easily, thanks in large part to the fine art projector’s wide-ranging support for multiple different types of common connection ports. It is not very often that we are able to review a projector that offers numerous different unique features that manage to set it apart from other product offerings in its class. And yet, the Impression1400 art projector manages to do just this with a laundry list of unique additions. If you are interested in technical bells and whistles, this fine art projector probably has you covered. From responsive (and oftentimes automatic) image adjustments to the ability to toggle between color, greyscale, and full black & white image projection, this fine art projector will surely add a versatile list of features to your creative toolbox. Amazingly, these features are just the start. 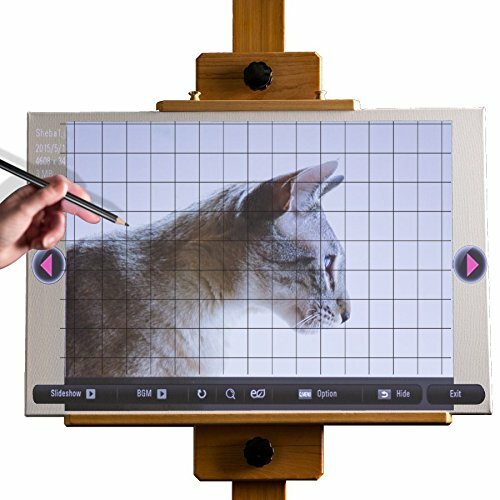 With 22 built-in grids for projection and recreation assistance, all artists, whether a professional level painter or a hobbyist with a newfound interest in artistic pursuits, will be able to effectively capture whatever is being projected onto their canvas in a manner that is both frictionless and highly enjoyable. These grids range from a traditional square-based grid to a circular bullseye-based design and manage to include everything in between, providing an invaluable resource to each and every modern artist. Better yet, images are able to be increased in size by the projector itself without distorting the quality of the projection. The ability to increase an image in sizes ranging from 125 to 400% is sure to open multiple different creative pathways for you while helping to promote further development of your own unique creativity along the way. And as if these features were not enough, the Impression1400 is able to support every major image file type, ranging from JPG to PDF, helping to make sure that your favorite image or digital inspiration is almost guaranteed to work with this particular fine art projector. Should You Invest In This Projector? While we do not believe ourselves to be in a position to tell our readers whether or not they should buy a product, we are always happy to help lay out some of the pros and cons in an effort to help them make the best decision for themselves. When it comes to a unit like the Impression1400, it is very hard not to recommend this projector to our readers in the market for a fine art projector. This particular product’s ability to combine high-quality features within a sleek form factor and at an outrageously affordable price is enough to make one beg the question why it should not be purchased. The mother of all artist projectors. As a Custom Painter and Airbrush Artist I look for the best solutions to create and complete my artwork. The Impression 1400 is an amazing way to project your reference image. You can work in a fully lit environment and you can still see your image clear at large scale. And I mean large I've projected work files the size of car and building before. And, while this thinking is totally acceptable and supported for a select number of our readers, we struggle to suggest this particular unit for those who do not find themselves within the relatively small fine art projector niche. 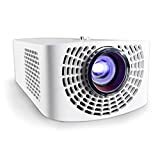 For example, if you are someone who is looking to purchase a projector to complement your existing home entertainment setup, we can almost guarantee that your hard earned money will be better spent elsewhere. Furthermore, if you are an artist that does not feel like they can seamlessly add a technology-heavy resource such as a fine art projector to their creative workflow, your funds might be better invested in lessons or other art supplies. The Artograph Impression1400 Art Projector is suitable for any person that likes the idea of having a high-quality projector. But since it’s an art projector, it’s a unit that particularly targets art professionals – or people who take art as more than a casual hobby. Yet it can be used by newcomers too. And yes, it’s also suitable as a regular projection unit, if you want something like that. Overall, the Artograph Impression1400 art projector is an unbelievably fantastic offering – for a few select people looking for a fine art projector. If you do not fall within this category, then we suggest you look elsewhere.